Cooking with Dina – Floral Punch + CBD! Home/Healthy Lifestyle/Cooking with Dina – Floral Punch + CBD! Hey everyone! Get ready for a delicious mixed drink recipe, sure to please any palate at your summer gatherings! 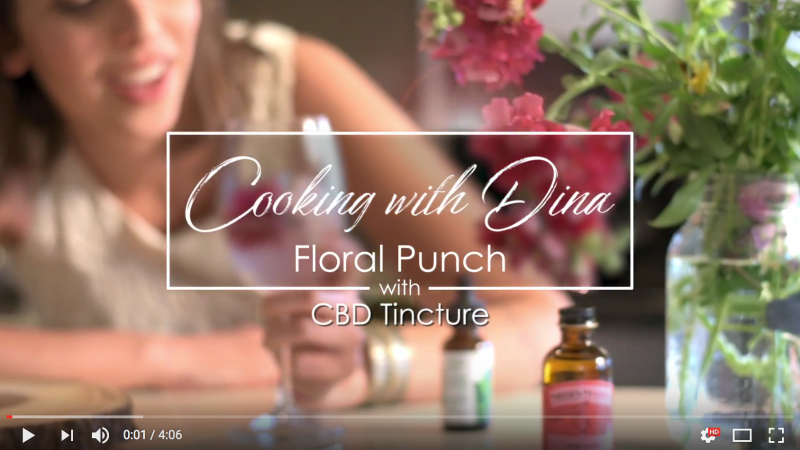 Watch Dina make a scrumptious Floral Punch with our CBD tincture, and then try it for yourself! It’s super easy, and your taste buds will thank you! Curious about how to cook with CBD? Check out our other video here on our YouTube channel for more ideas! Our tincture is one of our #1 products! It can be taken sublingually (under the tongue) and absorbed quickly, or added into foods and drinks (like this punch!) for a regular tincture experience. It doesn’t have that unpleasant “green” flavor, and blends seamlessly into your favorite recipes. Pure Hemp Botanicals Tincture is a great way to introduce yourself to the benefits of hemp extract. The dropper application makes it simple to find the perfect dosage for your needs. Pure Hemp Botanicals exact formulation allows for confident application so that you can always gauge how much hemp extract you are consuming at any given time. Grown, processed, and packaged in Colorado, Pure Hemp Botanicals controls the process from soil to oil, meaning we take pride in the quality and consistency of our products. All Pure Hemp Botanicals Tinctures are tested by an independent lab for potency. Lab results for each batch of tincture are available here. This product is non-psychoactive and contains less than 0.3% THC and is made from the finest quality hemp extract derived from 100% organically grown industrial hemp.